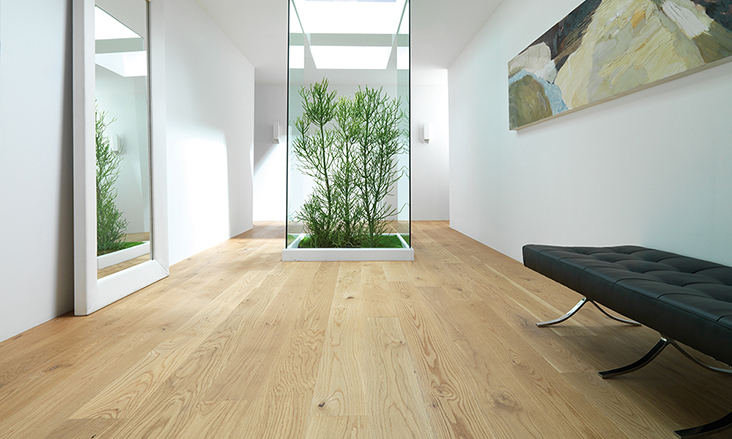 Natural hard wood parquet by Porcelanosa radiates warmth and simplicity. It has a capacity to fit in with any background setting, offering versatile design potential as flooring and also as a wall covering. Porcelanosa offers a range of eco-friendly hardwoods, made of different species available in a choice of finishes, designed to ensure maximum functionality and superior design appeal of natural hardwood always using ecofriendly technologies from the FSC (Forest Stewardship Council),. Our selections are divided into various collections, such as the Residence series or the Classic series, which are both exclusive products that encapsulate the timelessness of fine wood. Our exclusive selection with the rest of the Porcelanosa hardwood series adds a combination of solid wood flooring and single or double-layer parquet in various thicknesses, large or small formats, uneven surfaces with scratches, exotic woods, brushed, stained woods and colored treated oils or aged hardwoods in the various species of oak, beech or Jatobas – allowing its versatility to fit into any design style.